Because if history is anything to go by, you should now be reading one of my usual pre–race posts full of nerves and self-doubt. That is the pattern I have established and it is what we have all come to expect from this website. But no. Instead of fear and anxiety I am chipping away at my keyboard with the cheer and happiness of an oblivious cucumber. Don’t worry, I’m not oblivious; I am well aware of what is upon me. I am just so excited I don’t have time for nerves! It all started about 4 weeks ago, when I realised there was nothing more I could really do in terms of improving my training. Suddenly it was like a weight was lifted from my shoulders, and for the past four weeks I’ve felt some kind of strange freedom in knowing that I couldn’t realistically make any dramatic improvements to my triathlon abilities. My task over this time was simply to maintain or refine the skills I’d learned, and make sure I didn’t get injured. The last four weeks have felt fun. My last workout at home this morning. Pure fun and not too nervous. I’m not even nervous about the result on Sunday (yes, it’s happening this Sunday!) because I don’t really have any other major goals hanging on the result of The Noosa Tri. 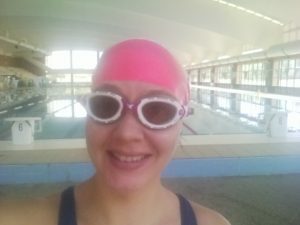 Back when I did my first triathlon at Bribie, I felt like my whole triathlon career was hanging in the balance as I tested out for the first time whether I could combine the sports of swimming, cycling and running. There was no denying the nervousness induced by that pressure. 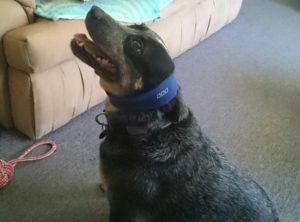 Then when I did the second triathlon at Straddie, I could not escape the threat that if I struggled too badly with those sprint distances then it would not bode well for my attempt here in Noosa – which is almost double the distance of the Straddie Salute. 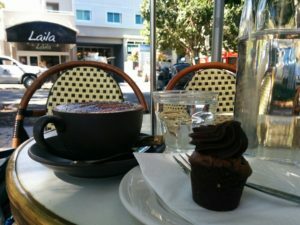 Having already paid for my Noosa entry and booked some very expensive accommodation, it felt like a lot was at stake. Choosing whether to have the chocolate cupcake or apple was about as stressful as my day got today. Now that the big event has arrived and I’m finally about to tackle the Olympic Distance Triathlon (1.5km swim, 40km ride and 10km run) I don’t have any major commitments resting on the outcome. I haven’t decided whether to do a Half Ironman yet. I haven’t signed up for any scary events. I can perform quite miserably on Sunday and it wont matter. Conversely, I can… have fun and do well and achieve the dream I set out to achieve over 12 months ago! It still wont matter, but the excitement that I might accomplish that fairy-tale ending is tantalising. It’s a bit like when you are going on holiday; there’s always a chance it wont live up to expectations, but you’ve done the planning and you’re pretty sure it will be as fantastic as you’re hoping. And ultimately, how bad can it possibly get? Whatever happens on Sunday, good or bad, I have worked hard to earn my place in the crowd and I will enjoy every moment of the electric atmosphere. Matilda hoped that by wearing her Lorna Jane sweatband she might sneak into the Noosa crowd. But we had to leave her at home. 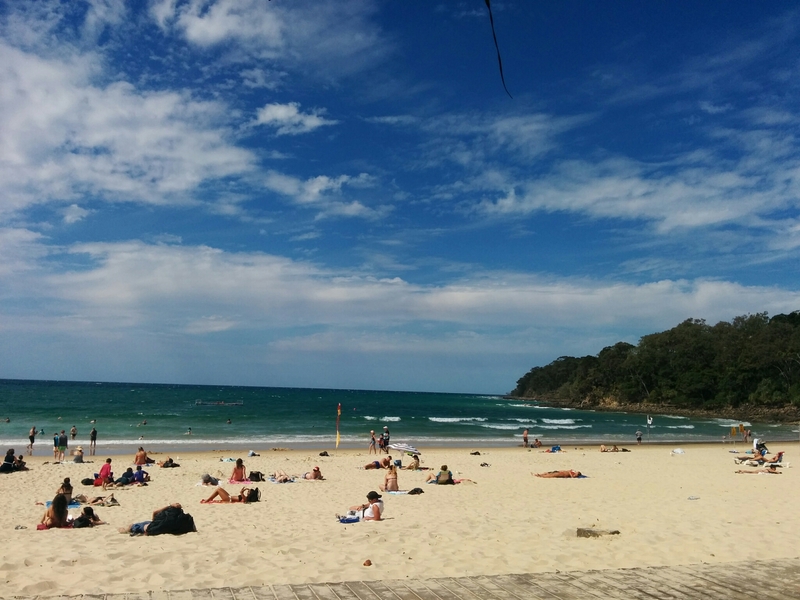 Shane and I arrived in Noosa today, so in actual fact we’re really having a bit of a holiday too. It’s a cherry on the top of my triathlon cake. We checked out the beach this morning and again this afternoon (see the picture at the top of this post) and both times it was windier than I was hoping for. I will be keeping my fingers crossed that the wind dies down before Sunday. Somehow I have managed to luck out with an excellent ‘wave start’. With most triathlons, competitors are split into groups so that the start is not too messy. 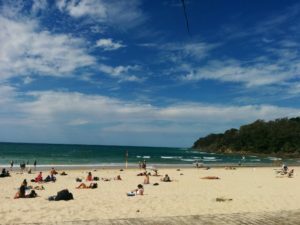 Here at Noosa there are approximately 9000 of us, so splitting us into groups (also known as waves) is essential and there are something like 20 different groups. Last year, the competitors in my group (female aged 30-34 with surname A-L) set off at about 8.30am. Which is the start time I had been preparing myself for. It was kind of a big deal, because starting at 8.30 would mean I’d be finishing just after midday, which would mean I’d be running in the heat of the day. Which is horrible. So when I logged onto the Noosa Tri Website last week and saw that this year my group has been allocated a start time of 6.53am, I was thrilled. It means I wont have to try to waste lots of time between dropping off my water at transition (at 5am) and my race start. I will be finished before it gets sweltering hot – hopefully. I will be finished in time for a yummy lunch. I can cheer other finishers on. I wont be the last person across the line even if it takes me a ridiculous amount of time to get there. For those who are interested in following along with my progress between now and the impending Race Report, you may follow me on Instagram. I have made my profile ‘public’ so you can spy on me without officially following me (in which case I wont even know you looked) or you can follow me without having to wait for your follow request to be approved. Basically, go to @aussielauren09 and have a look at what’s going on. 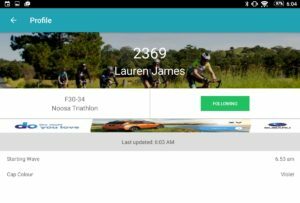 If you’d like to follow along with the race, there is an app for that. Search ‘Noosa Triathlon’ in Google Play or the App Store and download the top result. Click on ‘Athletes’ and search Lauren, then scroll down to Lauren James and click follow. Sorted. Otherwise, I will endeavour to update you as soon as possible. This entry was posted in Everything Else and tagged newbie, noosa, training, triathlon. Bookmark the permalink.